For those of you that couldn’t follow along with Episode 1, here is the butternut squash soup recipe in its entirety. You’ll notice that I left out the step about dropping a pot of hot curry squash broth on the floor, it tended to make the cook a little bitter! Peel the squash and cut into large cubes. Save the goop and seeds. Cut the onion in half and peel. In a large stockpot melt the butter and over medium heat saute the onion and squash guts until they start to carmelize. In a separate pan, slowly cook the bacon until crispy. Drain onto paper towel and dice when cool. Raise heat to high on squash goop while adding a few cups of water, cayenne and curry. Don’t worry if its too strong, you wind up using very little of this broth. Drop in a steamer basket with the diced squash on top and cover for 20 minutes or until the squash is soft. Blend squash with some of the strained steaming liquid until very smooth (but a bit thick). Keep tasting the puree and balance out the spiciness with some chicken broth (or add more of the spicy liquid if too weak). Drain and reserve some of the remaining liquid and goop in order to free up the pot to reheat puree. You may need a little extra chicken or squash broth to loosen up the puree. Add cinnamon, nutmeg, salt and pepper to taste. 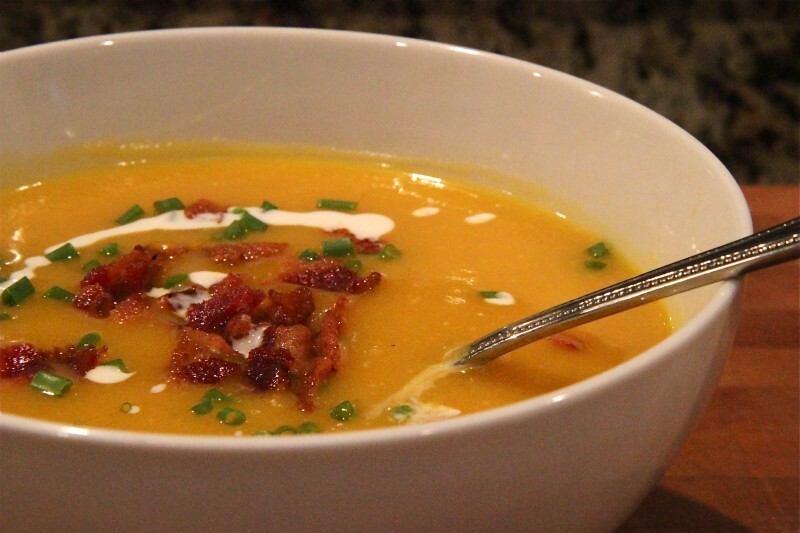 Ladle into bowl, swirl in a tablespoon of heavy cream and place a small pile of bacon in the middle. Sprinkle some green stuff on top to finish it off.